While Russia is one of the major exporters of raw materials to the West, it can’t boast about the quantity of its food delivered to foreign markets. Less than 1pc of the total share of world food imports comes from Russia. Nevertheless, Russian food manufacturers have ambitious plans to introduce Western customers to their goods. Although the export of Russian food has been steadily growing for the last decade from $1.5 bn in 2001 up to $7.1 bn last year, this data isn’t promising for the whole Russian food industry. The lion’s share of Russian food products are traditionally purchased by the former Soviet republics and only around a third or a quarter of these goods are imported by EU and other foreign states. It’s not surprising that ex-Soviet countries remain the major buyers of Russian food as, for many decades, they were a part of the homogenous market. Therefore, the stable trade relationship with these countries can be explained to a certain extent by inertia and shared history. But when it comes to the EU member-states, the USA and many other countries, only a few Russian food manufacturers have succeeded in exporting their merchandise there. For instance, Russian wines, produced by outlets like Fanagoria, Abrau-Dyurso, are distributed to Britain, Baltika beer from Saint-Petersburg reaches its customers in Denmark, while confectionary products of the Udarnitsa factory are consumed in Norway, and sweets and chocolates by Belogor’e enterprise from the Southern part of Russia go to Finland. Remarkably, alcoholic drinks remain one of the more lucrative items of export from Russia. It raises $116.6 bn from foreign countries outside of the former Soviet republics. 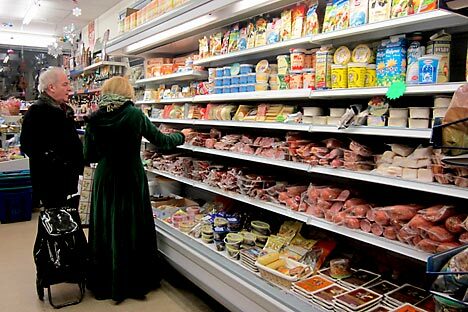 In many countries that do have specialist shops selling Eastern European food products, often the Russian foods on sale are actually manufactured outside of Russia’s borders. The recent survey of Russian food manufacturers and food exporters conducted by the Ministry of Economic Development sheds some light on the problems that they experience when trying to market their products abroad. Many Russian food producers said that they experience difficulties in obtaining information on the foreign requirements that imported goods must meet, such as the sanitary and technical requirements. Most of the manufacturers complained that the restrictions from foreign markets were very harsh. For instance, the EU sets a wide range of restrictions on food imports regarding its wrapping, sustainability, contents, additives and so on. It is one of the reasons why many attempts to introduce Western consumers to specific items of Russian food fail. Another obstacle for selling to Western markets is that foreign customers are not familiar with many Russian food items and even the names of these products are usually hard to spell, such as pryanik or ryazhenka. This is because, for many decades, the Russian market has been isolated from the West culturally and politically and as a result people in the West are unfamiliar with the national food of Russia. Bulatov says that promoting Russian foods at exhibitions and trade fairs could help get the foods more widely recognised. However, he says the manufacturers also need to pay attention to their advertising materials. Brochures, booklets, media kits, and so on, need to be produced in different languages with clear explanations for each of the countries they are targeted at. Another fundamental obstacle that both the exporters and the experts point out is the insufficient level of support from the state. “A list of various fields of manufacturing that are eligible for state subsidies has recently been published, but the food industry, unfortunately, was not mentioned there,” says Dmitry Bulatov. Other measures that would help the underdeveloped food industry expand include business privilege taxation, promotional bank loans and other forms of support. The role of the national agricultural sector is vital in terms of Russia’s export potential, states Dmitry Bobkov, press attache of the Ministry of Agriculture. “We are about to reach the estimated targets of wheat, potatoes, sugar and sunflower oil production,” he explains. “The targets for poultry production are about to be reached this year too, whereas meat production will take another three to five years to reach its target. As agricultural production expands, exporting it will be a priority, according to the experts. But for now most of the food produced in Russia remains the domain of its domestic citizens and those living in Russia and the former Soviet republics.